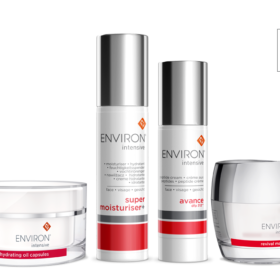 THE Environ Skin EssentiA range is a complete range that provides all the products that you need in your skin care regime. The products have been scientifically researched and are able to deliver highly effective concentrations of Vitamin A and antioxidants to the skin. The active ingredients are introduced in a special “step up” system to ensure that the skin continuous to improve as one moves up the concentration ladder. These highly effective moisturisers provide the exact nutrition that the skin needs to create the appearance of a smooth and youthful looking skin. 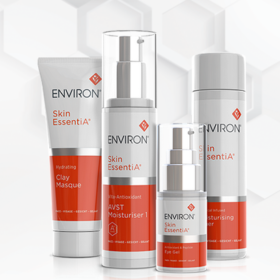 THE products in the Environ intensive range, are each formulated with unique ingredients to focus on areas that require specific attention e.g. dry skin, uneven skin tone and sun damaged skin. This range can be paired with the Environ Vitamin A step up system for beautiful healthy skin.